We have also had a lot of fun following the exploits of Philip Parker-King, Pringle Stokes, and Robert FitzRoy, who surveyed the region in a fleet of whaleboats attached to His Majesty’s ships, the Adventure and the Beagle; and we’ve enjoyed untangling the trail of words left behind by William Skyring, a member of the same team of surveyors but one whose command was a gaff schooner capable of beating up the narrow channels of the Pacific coast. In the 20th century this region also began to draw the attention of individuals whose intent was much like ours. First came Slocum, whose adventures have entertained both landsmen and those of us who follow in his wake. Bill Tilman, passing this way some sixty years later, also left a trail for us to uncover as he made his way through the Straits, up the Smyth Channel, and round to the mountain which it was his ambition to climb. 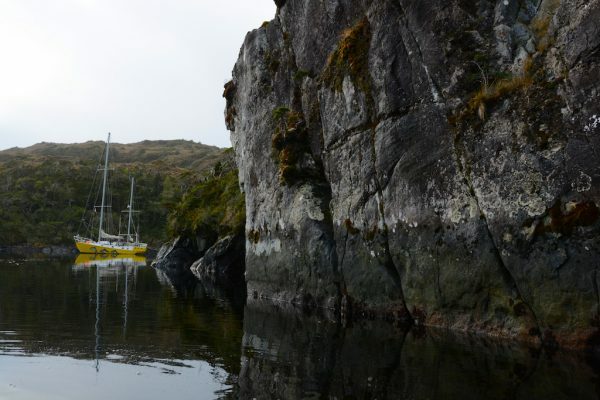 But no other traveller from the past era has inspired and touched us so much as Edward Allcard – a lone sailor and pretty much the first yachtsman to spend time exploring Tierra del Fuego and Patagonia. 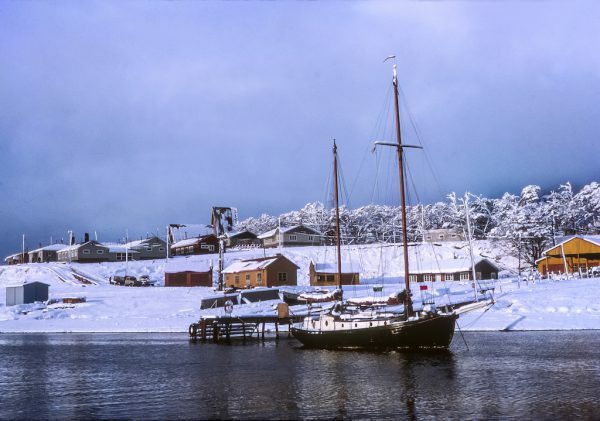 Beginning his expedition from the River Plate and the 57th parallel, Edward Allcard sailed south, rounded Cape Horn in April of 1966, and then, after spending the winter in the Beagle Channel, sailed north via the Straits of Magellan to the city of Valparaiso. This brought him back to that same latitude whence he had embarked a year earlier – but what an adventure lay between these two shores of the South American continent! With its emphasis on decorum, ritual, and brotherhood – and with a uniform which includes morning suits and ‘white tie’ – this school for the sons of nobs and snobs turns out characters such as David Cameron and Boris Johnson; but it is also capable of producing fine gentlemen – and Allcard was such a one. Seemingly, the boarding school combination of mental and corporeal discipline together with the indoctrination regarding the student’s social status has varied results. In some it causes the heart and conscience to be stunted and the ego inflated, but in Allcard it encouraged a blossoming. This was a man who, on finding a young woman stowed away on his boat, thought less of the inconvenience to himself than of her well-being. Moreover, this was a man who, on receiving a fan letter from a distraught girl who was locked up in a loony bin, promptly arranged to meet her and took her travelling. And then he married her. This was also a man of astonishing mental and physical stamina. He could endure four days of gale-force wind, in a boat which was on the point of sinking and in clothes which were as wet as the sea, and, at the end of it all, merely remark that he hadn’t died of hypothermia because it hadn’t been invented. This was a man who was master of his mind and body – and a man who, at the age of 90, could still climb the mast of his yacht. But why do I, too, speak of him in the past tense? Edward Allcard turned 102 last October; and it was just a few months before that anniversary that he finished writing the fourth in a series of books about his adventures under sail. Edward recalls that he was taught to sail at the age of six by his grandfather’s boatman – (as I say, his was no ‘common’ background) – and his first boat was bequeathed to him, when he was twelve, by that same gentleman. A smart mahogany dinghy, 15ft long, she was to be the vehicle for his first single-handed voyage – The Cruise of the Dora – which was undertaken on the Thames. One imagines that the inspiration for the voyage may have come from reading Jerome K Jerome; but unlike the Three Men in a Boat, Edward didn’t have a cabin to sleep in, so he slung an awning over the boom. “I cast off her painters and slowly paddled into the main stream of the Thames, half a mile above Teddington Lock. I hoisted the mainsail and unrolled the jib and swiftly glided downstream to the lock … I forked out my bob, and went through. … In the brilliant sunlight the green banks of the Thames looked lovely until the tide went out. Well, then it was not so lovely. Here Edward was to be joined, for an interval, by a friend. On finishing school, Edward went on to train as a naval architect – and he is now the longest-standing member of the Royal Institution of Naval Architects. 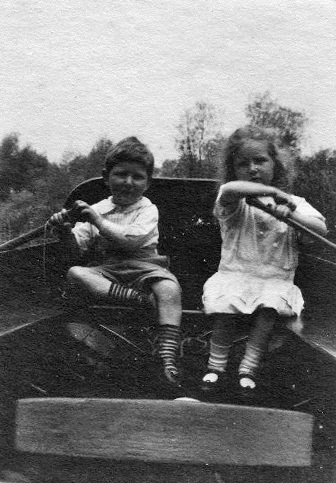 Meanwhile, having outgrown Dora he bought a succession of boats more suited to the kind of adventures that he wished to enjoy. His first single-handed offshore passage was made in 1939 when he sailed from Scotland to Norway and back. Ten years later he crossed the Atlantic single-handed, taking 81 days to get from the Canaries to New York. 81 days seems like rather a long time for an Atlantic crossing, but then his boat, Temptress had no self steering – self steering hadn’t been invented – and so the sailor had to heave to whenever he wanted to leave the tiller. At first this meant stopping whenever he needed to sleep, cook, or eat, but eventually he found that he could leave the boat to fend for herself under headsails alone. Temptress, with Edward at the helm. Like the old sailor, she too is still alive and well and has just passed her centenary. Allcard really did not want the inconvenience of caring for this young woman – he didn’t want to have to share his scant rations; he didn’t want to have the worry of a seasick passenger; and above all he didn’t want to have to deal with the publicity and the paperwork which would surely result when they arrived in Europe – but if he took her back to her island home, then what would become of her? And so that was what he did. It is impossible for those of us who have not lived with puritanical morality to understand how prudish it is. The story made the newspapers world wide, and there were those who said that, having allowed the girl to remain aboard his boat, the proper gentleman ought to marry her! Instead, having assured himself that Otilia was safely settled into her new life in Europe, Allcard got back on with the business of single-handing. While in New York he had bought another yacht – a derelict ketch called Wanderer – and so his next solo passage was another west-to-east one. On arriving in England after a very stormy trip, he was contacted by Eric Hiscock. 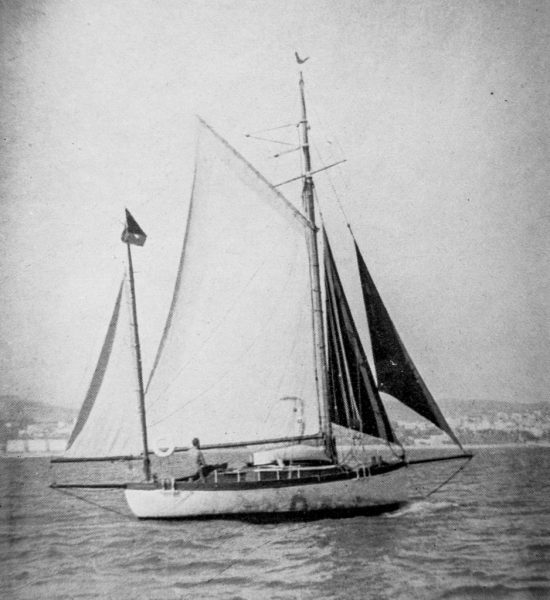 At this time the Hiscocks were still home-waters sailors, but Eric had already written about the voyages which he and Susan had made in their first boat – and that boat happened also to be called Wanderer. He was now having another boat built, with a view to making a circumnavigation, and the new boat was to have the same name; so, would Allcard mind awfully…? This surely left our hero in a bit of a fix, for he could not bear the thought of changing the name of a vessel which had already been ‘alive’ and sailing for 50 years – that would surely bring upon him the wrath of the gods of fortune – and yet he was far too much of a gentleman to refuse the request. Thus, Wanderer became Sea Wanderer. She was to be the favourite of Edward’s boats – and in the course of his lifetime he owned eighteen – and with her he was to travel, alone, right around the world. 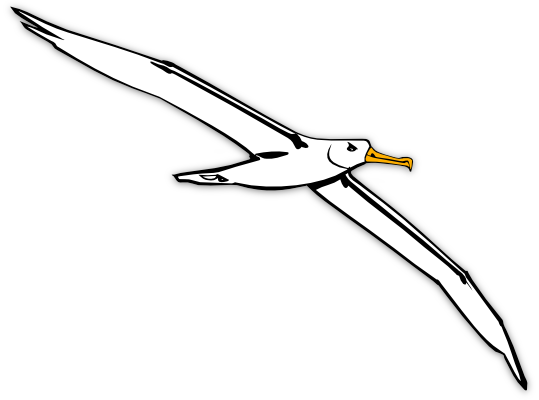 Unlike the Hiscocks, Edward Allcard never sought fame, and although he wrote about his travels it does not seem to have occurred to him that anyone would wish to follow in his wake. 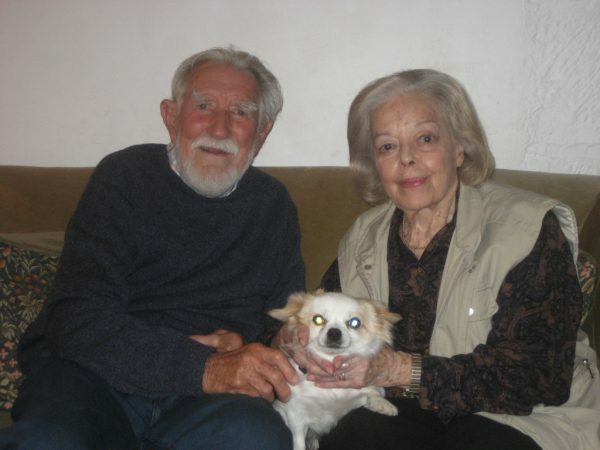 Whilst Eric and Susan were the inspiration for a whole generation of others and might rightly be said to be the father and mother of the world cruising community, Allcard, by contrast, was living his life out on a limb. Mind you, whereas the Hiscocks were just following the ‘milk run’ – the easy route around the world, in the Tropics – Edward Allcard was travelling via Cape Horn. We were obviously still outside the bay, but I felt that, by making occasional headway in the lulls, it should be possible to regain my anchorage. It was a happy hope but, as it turned out, a vain one. With just ten more horses on my fifteen-horsepower engine, it probably could have been done. Meanwhile, unless the gale slackened, I felt the best I could do was to try and maintain my position – pointing upwind towards the high, hidden shore. I reckoned that an easing of the wild sea would alert me when we were getting too close, and eventually daylight would unmask my position. But hour after hour ground by in the all-pervading blackness, and the easing of the seas never came. Rather, they grew larger and more confused. The engine pounded willingly away, but it became more difficult to keep the boat up into the howling wind. One hail-squall was so violent that I had to shield my face to prevent it being lacerated. Icy water had long since penetrated inside my oilskins, causing prolonged shivering fits. […] They say that shivering is nature’s way of combating cold. It was nice to know that the more I shivered the warmer I was getting. After over twelve frigid hours at the unprotected helm, I was becoming raw and exhausted. Dawn would make the difference. Dawn! Dawn! Would it never come? Not wearing a watch, I had no idea of what actual hour it might be. Only daylight would bring sanity to my world. So I gasped in relief as a groping grey at last dissolved the dregs of darkness. But all that met my tired and incredulous eyes was an endless tumult of waves right to the horizon. Despite reasonable visibility, no land was in sight! With senses dulled, I gazed around in confusion. This lack of land anywhere in the vicinity explained the mounting seas. Then a white peak appeared among the clouds over the southern horizon. I stared stupidly at it, and automatically at the compass. South? How could land be to the south? Could it be Staten Island? Surely not! I blinked my salt-encrusted eyes. It was unbelievable. We must have been swept, stern-first, downwind some fifty miles during the night. At 06:00 I wrote in the log, “Very bad news.” All was now clear. Like Captain Schouten of the Eendracht, I had been driven back by the wind – but, unlike him, I had been carried right through the deadly Le Maire Strait. 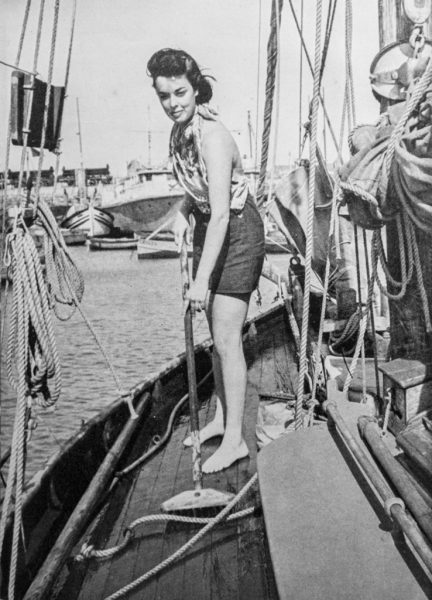 Edward Allcard’s lone circumnavigation took him sixteen years – but that was largely because, after he reached New Zealand, he was no longer living his life alone; he had met Clare. Clare, that unhappy girl who wrote to the seafarer from an ‘Institution for the Insane’, has proved to be a shining light in Edward’s life – and she also proved to be a good sailor and a very good writer. 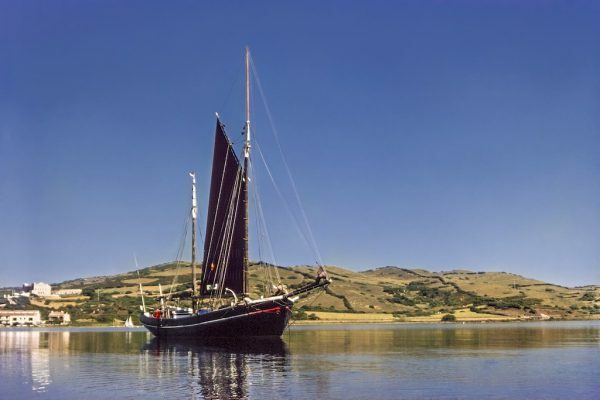 The couple eventually acquired a 69ft Baltic trader which they and their little daughter and various friends then spent the next 32 years sailing and maintaining. Clare wrote a wonderful book in which she describes the family’s passage from Antigua, via England and Denmark, to the Seychelles. Along the way they were rammed and almost sunk by a 50 ft French fishing boat, robbed by the Italian Mafia, attacked by the Ethiopian Navy, and fired upon, captured, and jailed for spying by the South Yemenis. And that’s to say nothing of their adventures with the cockroaches, a rat, and the rot. Edward was in his nineties before he had to admit to himself that he could no longer give to Johanne Regina the care and attention that an antique wooden ship demands. 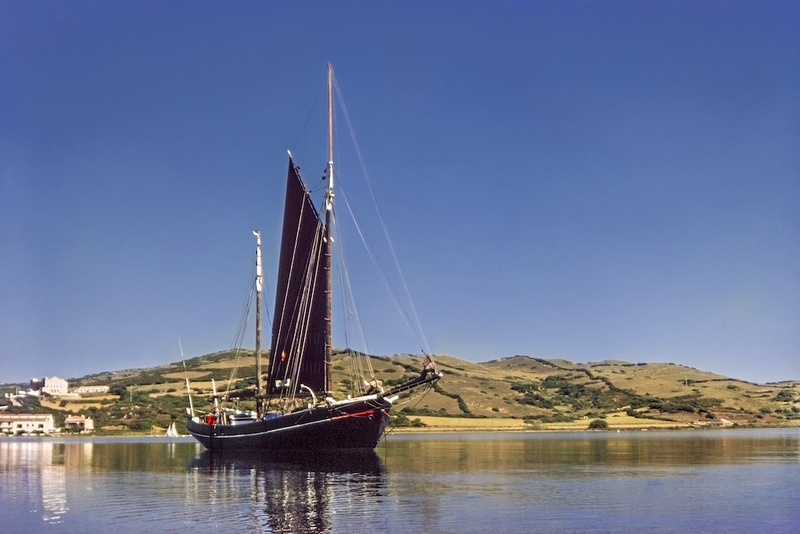 It was at this point that he handed her along to a dear friend who had long admired her and who managed to persuade the port of Badalona (Cataluña, Spain) to turn her into a sail-training ship. And then, one imagines, he looked back at a long life which had been lived so very much to the full… and it occurred to him that there was a gap in the literature: he had never written of his adventures in Tierra del Fuego and Patagonia. So, at the age of 96 – and with the aid of his logbooks, and the equally important support of his youthful wife of 70 – he got down to the business of remedying that omission; and the result was Solo around Cape Horn – and beyond. During our travels through the channels we have been privileged to have a draft copy of Edward’s new book, and the opportunity to read of his exploits here 50 years ago has added greatly to our enjoyment. Moreover, our experiences here have added to our appreciation for this master mariner. Sailing a small boat through this region requires stamina. The weather is odious; the winds and the currents are contrary. And there is no one to turn to if things go wrong. Even in this age of electronic navigation we have had to be careful. We have found rocks where none were charted; we have grounded on shallows; we have been smitten by williwaws. We have regularly spent an entire day beating to and fro, making thirty or even forty short boards for a fifteen-mile gain. And at the end of every hard day’s sailing we must find a safe harbour and make ourselves secure. With the aid of Giorgio’s cruising guide, finding a safe place to anchor is no longer the obstacle that it was for Allcard, but the shores in this part of the world are often steep to, so that one has to drop the anchor a stone’s throw from the beach and take lines ashore. And all this, Edward did alone: The sailing, the line-handling, and the cooking – not to mention the wood cutting for his stove and the water fetching. And yet he also found time to climb snow-covered mountains (in his wellies!) and was forever foraging for mussels or hunting for geese. Throughout the adventure – and throughout the book – Edward’s old Etonian gentility and stoicism, coupled with his perpetual good humour, shine. 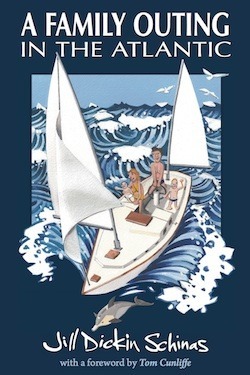 This book by the very last of the founding fathers of the cruising scene is certain to become a classic of yachting literature – and its release coincides with the re-release of Clare Allcard’s A Gipsy Life. Two ‘golden oldies’ from the same family! EDIT: Edward died a few weeks after this article was published, in July 2017. Thanks so much for this – I’d never heard of him and now I’ve got some reading to do! This is a very full account, one of the best I could find. Well, it appears from his obituaries that he was married twice and had a child from each marriage, and yet the first one is absolutely written out of history. Do you know any more about this? Her name was Michelle (according to Clare) and the daughter is Dora, significantly. I do not see how anyone can “blossom of their own accord”. We are all the fruits of the soil in which we were grown. Nevertheless, conditions which might stunt one person can sometimes prove fertile for another. This is partly because we are very much affected by the circumstances of our parenting, but also because we all begin life as different seeds, with widely differing tendencies. I would say that the soil of Eton did not produce a good crop in the years that Cameron and Boris Johnson were there… But I also know another chap who is very much a victim of that same school. Yes, Edward was married twice. I don’t know much about Michelle. I believe that they had separated before he set off to cruise. I think this was not because the lady disdained adventure; on the contrary, from what I’ve heard… But that story is not mine to tell. Edward’s elder daughter, Dona, has not been “written out”. I guess it’s just that not everybody feels the need to drag all of his bed linen and all of his family into the public light. (Another fruit of his upbringing, perhaps?) As I understand it, Dona has always got on well with Clare and with her half-sister Kate. She read a farewell poem at Edward’s funeral.